My Name is Vijay, a certified SAP Ariba associate. I had the privilege to Go live SAP Ariba Collaborative Supply Chain globally and first to implement SAP Ariba add-on in the Asia pacific region.Since then, I have been working on various functionality and integrations of SAP with SAP Ariba. Add-on to SAP ERP to directly connect to SAP Ariba cloud solutions offering quick install of adapter on to SAP ECC system which generate cXML messages from SAP ECC. These are transmitted to SAP Ariba via SOA Manager and errors are handled via forward error handler (FEH) or Application Interface Framework (AIF). This feature at current state is limited to buyer only. Some Seller still use the add-on which is no longer an option available. 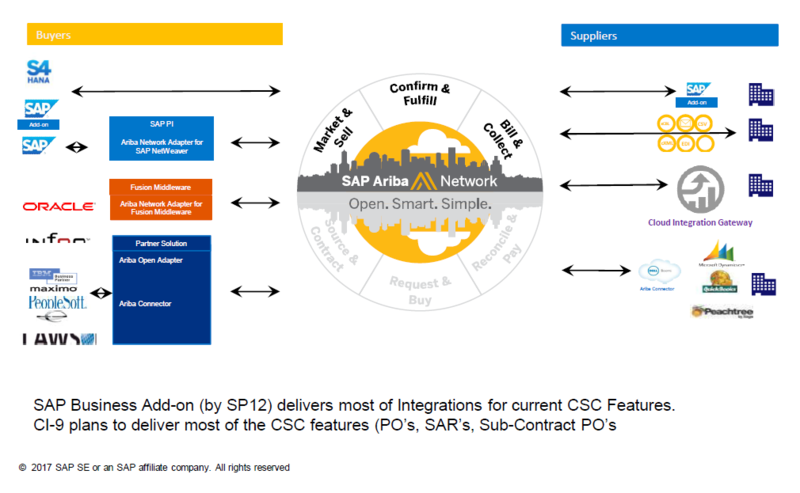 Adapter for SAP Process Integration (PI/PO) Connects SAP ECC via IDocs, RFC, BAPI while translating SAP ECC transaction to cXML for SAP Ariba. The design package currently is CI9 contains contains ntegration processes, interface objects, and mappings.The cXML Adapter installed on the SAP NetWeaver PI component, which conforms to the J2EE Connector Architecture (JCA) specification, and implements the cXML transport protocol. SAP Transport files installed on the SAP ERP system. Native Integration with SAP S4HANA delivers native integration(w/o Add-on) with Ariba Network. S4HANA handles cXML natively and is install in the S4HANA core package from the XX2016 version onwards. Cloud Integration Gateway, powered by SAP Hana Cloud Integration (HCI) is he newest baby for SAP Ariba where SAP Ariba manager the mapping and translation for you this minimising the TCO for customers. It comes with a Connect Onces and is limited to Supplier at this stage. It runs on the HANA Cloud platform and provides Single Sign-on options for Ariba Network. It supports AS2 and HTTPS protocols.It has a standard Mapping repository and provides flexibility to use non CXML formats it has a integration Wazard, Development tools and various standard feature that help supplier test and connect faster. I will be writing a separate blog for Coud Integration Gateway. I will be posting blogs around integration of SAP with SAP Ariba. please suggest steps for native integration of S4H 1610 with Ariba.